4 :: Gerrards Cross Golf Club is considered one of the most attractive courses in South Buckinghamshire. Kindly sponsored by Harwood Hutton. This dog-leg left requires a well struck drive. 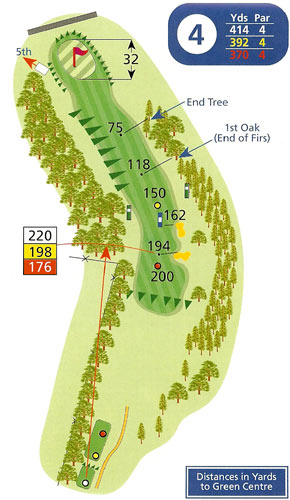 The fairway gathers balls towards the bunkers on the right side and there are penal trees and rough on the left. From the corner of the dog-leg the fairway drops down to a green set in a hollow. An over hit approach will find trouble beyond the green and a leaked shot to the right will require a tricky recovery shot.